The 3D debut of Disney’s 2009 adventure movie G-Force is a 3-Disc Blu-ray 3D/Blu-ray/DVD combo pack. 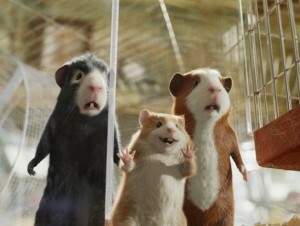 From famed producer Jerry Bruckheimer — who’s no stranger to Disney’s adventure films having been behind the Pirates of the Caribbean movies, Prince of Persia and The Sorcerer’s Apprentice — G-Force tells the story of an elite team of crime-fighting guinea pigs who use their high-tech spy equipment as they race against the clock to save the world. Among the actors voicing the guinea pigs are Nicolas Cage (Astro Boy ), Sam Rockwell (Moon), Jon Favreau (Couples Retreat), Penelope Cruz (Broken Embraces), Steve Buscemi (The Messenger) and Tracy Morgan (Death at a Funeral). The cast also includes Bill Nighy (Wild Target) and Zach Galifianakis (It’s Kind of a Funny Story) in person. The family movie had mixed reviews when it was in theaters, but showed popularity with a tidy $119 million gross. The G-Force Blu-ray 3D set contains a number of special features, all of which have appeared on previous DVD and Blu-ray releases of the film.